A two-day creative writing course with Rebecca Sharp. In this (very) creative writing course, you will develop innovative techniques for creating detailed imaginative worlds with originality and depth. We’ll explore elements in all forms of writing – poetry, prose, performance and creative non-fiction. You might intend to focus on one, or else try something new – all styles will be catered for. Rebecca’s own work includes devising and realising complex interdisciplinary projects: she will support you with an idea you may already be working on, or else guide you in starting something new. Activities will include creative exercises (not just writing! ), one-to-one time, walking, mapping, project planning, editing, and some sharing. The course schedule and details of what to bring will be provided after booking. Rebecca Sharp is a writer and artist, originally from Glasgow and now based in Fife. Her work spans theatre / performance, poetry and prose; including a wide range of interdisciplinary, site-specific and collaborative projects, working with other artists across multiple art forms. 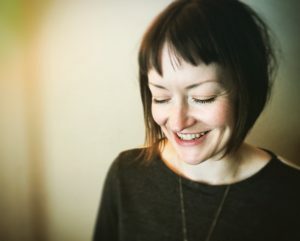 Her plays include – Last Child (Arches theatre, Glasgow 2001 and HERE Arts Center, NYC 2002); Danger: Hollow Sidewalk (Arches theatre, 2006); The Wakeful Chamber (Lemon Tree, Aberdeen and Oran Mor, Glasgow 2015 – A Play, A Pie and A Pint + Sound Festival co-commission, score by Pippa Murphy); and The Air That Carries The Weight (Traverse theatre, Edinburgh 2016 – Stellar Quines theatre company, design by John Byrne). Other work for performance includes: For the Bees (2014), with Mr McFall’s Chamber and composer Ailie Robertson; The Unmaking of Mary Somerville (2014), with Stellar Quines Theatre company and Scottish National Portrait Gallery; and Rules of the Moon (2013) with sound artist Philip Jeck. Poetry includes: The Ballad of Juniper Davy and Sonny Lumiere (2010), publication and performance of poems and original score, with fine artist Elizabeth Willow and METAL Liverpool; Fathoming: setting poetry to silk (2011), poems and silk objects with textile artist Eva Fulinova; Unmapped (2013), exhibition and publication of poems and paintings with artist Anna King (RGI Kelly Gallery and StAnza Poetry Festival); and Five Charms for the Potingair (2017), poems and essential oil scent-blends. Prose work includes Little Forks, publication supported by Creative Scotland and Gaelic Books Council, which toured as a performed reading in English and Gaelic 2012-14; and Found Tarot (2017), site-specific story-making with Verdant Works Museum, Dundee. 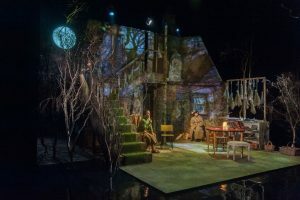 Production shot from the play The Air That Carries The Weight by Rebecca Sharp. Performed at the Traverse Theatre, Edinburgh in March 2016. Directed by Muriel Romanes, set by John Byrne, lighting and costume design by Jeanine Byrne, sound by Pippa Murphy. Photo by Marc Marnie.